Over the last five years, I’ve read 60 titles for Parenting by the Book. 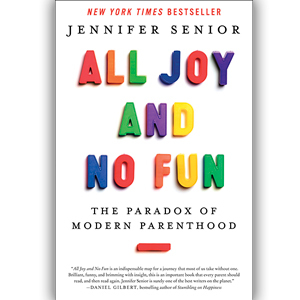 All Joy and No Fun by Jennifer Senior is the first to move me to tears. It’s not a parenting book in the traditional sense, offering advice; rather, it combines research with relevant anecdotes to capture the paradox of modern parenthood. By the time you finish reading it, you realize that just as standardized tests can’t accurately measure what students learn at school, social science data doesn’t show the real joys of parenting. Senior focuses on answering the question, “How did having children affect their mothers’ and fathers’ lives?” She begins by exploring the complications of modern parenting: a lack of understanding of what having a baby really means, the loss of work boundaries thanks to technology, and an opportunity to explore one’s own potential longer than ever before. Then, Senior walks readers through the stages of parenthood, and while there’s much food for thought, the following subjects really struck me. She begins with autonomy and what Senior considers the awkward topic of boredom. How long can one play Littlest Pet Shop without losing one’s mind? Having been a stay-at-home mom for seven years, this was something I could relate to firsthand. She explains that while one of the greatest gifts children give us is the ability to live in the moment, it makes getting into a flow hard to achieve. Structure provides parents with a release from boredom, except the nagging necessary to wrangle toddlers into action often negates its rewards. Senior looks specifically at one stay-at-home mom, who manages a photography business from home, and says she has “chosen the hardest path” – one more and more of us are choosing. We don’t want to miss out on parenting our young children, but we also don’t want to give up on our professional dreams. I was home with my kids during the day and taught English in the evening. Much like Jessie, the mother Senior spotlights, I was constantly being pulled in different directions in my attempt to “have it all.” While “fun” wouldn’t have been the word I would have used to describe it then, now that I’m back to teaching full-time, I’d argue those were some of the best years of my life. All Joy and No Fun also devotes a considerable amount of attention to marriage and how the division of labor at home is often still unequal. According to Senior, in 2011, two sociologists “found that mothers, on average, spend ten extra hours per week multitasking than fathers, ‘and that these additional hours are mainly related to time spent on housework and childcare.’” Therefore, when Senior shares the results of a UCLA study – the biggest stress reliever for mothers was not leisure activities but seeing their husbands do housework – I’m not the least bit surprised. I know nothing makes me happier than walking into the kitchen after I’ve finished reading to my kids at bedtime to discover that my husband has cleaned up. While Senior does a great job of illuminating the simple gifts of parenting, I found her chapter on “Concerted Cultivation” to speak to the heart of modern parenting. Senior notes, “Children stopped working, and parents worked twice as hard. Children went from being our employees to our bosses.” Interestingly enough, Senior notes, that “children have acquired more and more stuff the more useless they have become.” Many middle class parents have come to believe that it’s their responsibility to perfect and refine their children in order to ready them for the world, Senior argues. The problem is we don’t know exactly what we’re preparing them for. In the old days, parents prepared their children to take over the family business but nowadays choices and possibilities abound, leaving parents baffled as to how to best to help their children to be successful. As a result, mothers have gone from “housewives” to “stay-at-home moms” and Senior explains that this “change in nomenclature reflects the shift in cultural emphasis.” To say that parents are responsible for their children’s schooling, clothing, or feeding means something entirely different than it did even fifty years ago – when moms were sewing dresses and canning foods. Ultimately, Senior’s chapter on “Adolescence” was my favorite; for it exposes the fact that teenagers “brimming with potential” make parents wonder “who we’ll be and what we’ll do with ourselves once they don’t need us.” And while my older daughter is only twelve, it really got me thinking about my life’s second act. So if you’re inclined to agree with Senior, who argues that “kids open windows to new activities and new ideas” and thereby make our lives more meaningful, than I highly recommend you read All Joy and No Fun. For, as you already know, while not everything about parenthood is fun, ultimately parenting is a joy. Follow @WinterhalterV on Twitter for updates on blog posts or like Parenting by the Book on Facebook.